I created this birthday card for Petra, who lives in The Netherlands. The pattern is by Sjaak CO-2017-011 and is available from Ann's Paper Art. Threads are Mettler Polysheen 2920, 3257, 5833. 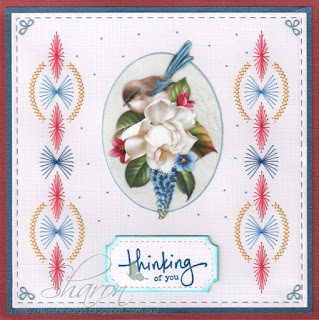 Image is from Lili of the Valley art pad called "English Charm." Happy Birthday stamp from Darkroom Door. Outer die by Elizabeth Crafts, Dotted Scallop Squares-1175. 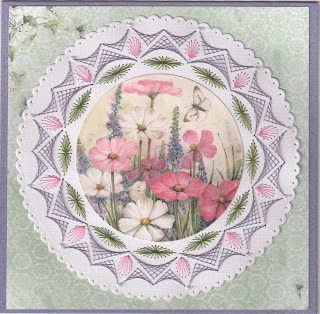 Oval die by Lawn Fawn LF858. it doesn't show up in the picture. Tim Holtz "Peeled Paint" was added around the oval die. Pearls have also been added. I hope that everyone is having a wonderful Monday. Thank you for coming by and looking at My Craft Cupboard. 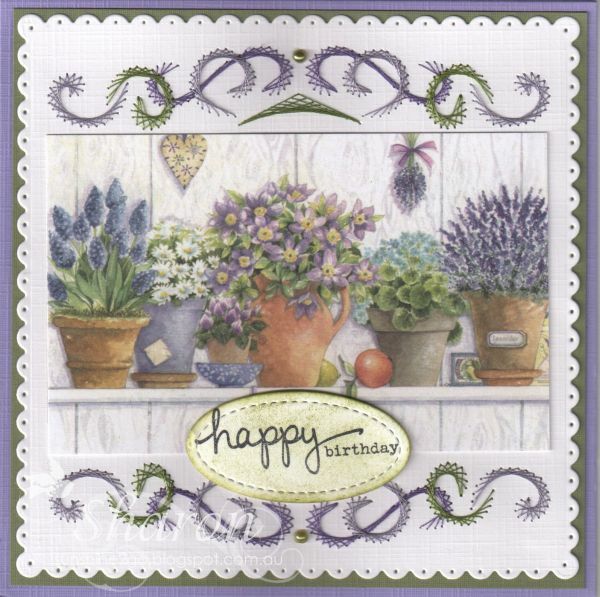 I created the above birthday card for a dear friend whom is in her 80's. The pattern is by Sjaak CO2018-048 and is available from Ann's Paper Art. Threads are Mettler Polysheen 2550, 3251,5833. Image by Marianne Design "Mattie's Mooiste" MB0164. Background paper by Studio Light. My friendship card was especially created for Petra and her husband. 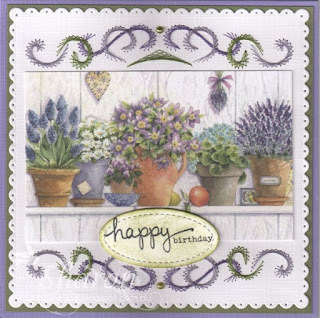 The pattern is by Sjaak Van Went "Stitch and Do"card only set 21. Threads are Mettler Polysheen 0811, 2320, 3522, 3711. Image by Ann's Paper Art APA3D017. Thinking of you stamp by Darkroom Door. Hobbydots have also been added. we are having a wonderful Autumn day filled with lot's of sunshine.